'Eddie The Eagle' soars onto the big screen on the 28th of March. I was fortunate enough to see a pre screening for the newest attempt at an uplifting sports movie. 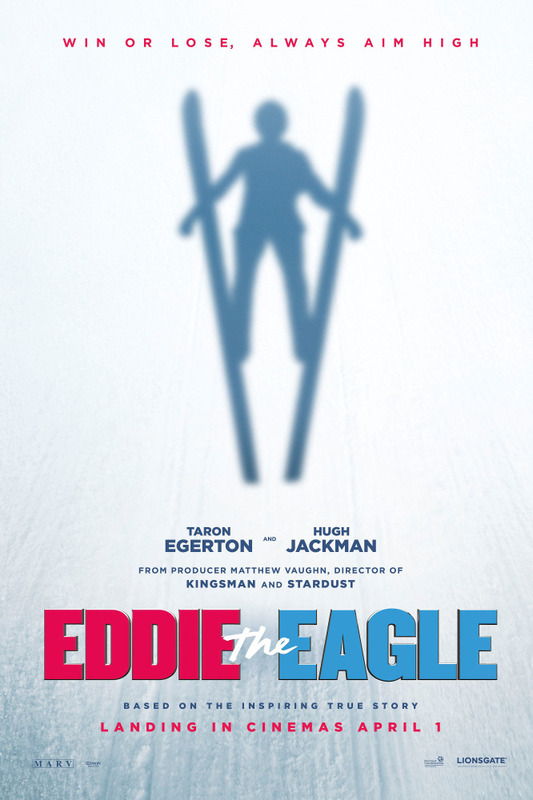 Based on the true events of Michael 'Eddie The Eagle' Edwards, would the film fly high or would it be a crash landing? 'Eddie The Eagle' follows the life of Michael- also known as Eddie- Edwards (Taron Egerton) who has always dreamed about being an Olympian from whenever he was young and struggled to walk. After being cut from the British Olympic Ski team, Eddie travels to Germany to try his luck as a Ski jumper. After being rejected help from the coaches, his courage wins him the opportunity to be trained by former ski jumper Bronson Peary (Hugh Jackman). Despite not having the backing of his country and not being believed by many, Eddie's never die attitude will look to carry him to the 1988 Winter Olympics, fulfilling his dream. Much like many sports movies, 'Eddie The Eagle' is most definitely inspiring and very uplifting. To Eddie and Bronson, it isn't about winning. The dream is to be at the Olympics and the story is really chasing the dream that seemed so unrealistic. The determination on show when everything is against the characters is most definitely inspiring. The triumphs along the way do a great job at making you feel great and will leave you feeling awfully giddy at times. You will feel yourself wanting to cheer at times when Eddie succeeds just as some people in my screening did. Edwards (Egerton) and Peary (Jackman) celebrating together. The film is very much so a comedy and will give you a great amount of laughs. Quite a lot of this has to do with Taron Egerton as the awkward but high spirited Eddie who lacks main social skills. From the first scene where we meet the grown up Eddie, it shows perfectly what the character is like and it only progresses and gets funnier as the movie goes on. Hugh Jackman was also fantastic as he played a ex pro with a great love for alcohol. Seeing this grumpy, wise cracking drunk was great and worked perfectly against Eddie as the more brash and brutally honest character. Bronson does grow to show more respect and have more banter with Eddie rather than ridiculing him which comically works to the same standard. Also make sure you listen out for a certain announcement about a certain team in a different event. The chemistry between Egerton and Jackman is fantastic. The two work very well together and bounce off one another with ease. The strong chemistry added to their strong performances and only made them better. Taron Egerton is a star and we should hopefully see him leading many more films and hopefully franchises in the upcoming years. He is fantastic in this role and shows great charisma. And to stand out in a film featuring Hugh Jackman and Christopher Walken is a great compliment. He was definitely able to capture the magic that made Eddie a cult hero for many around the world. Jackman himself was also fantastic. It was great seeing Wolverine smoking a cigarette whilst performing the ski jump. Unlike his most famous role, Jackman takes more of a mentor role and really helps and looks out for Eddie's best interests rather than just doing what he pleases. The pairing was a great match and worked incredibly well together. The film also- maybe unintentionally- does reflect British sport today. At the start we see Eddie be scrutinised due to him not being from a certain private school when he is equally talented. Oddly enough, this reflects current situations in British sport particularly in football. Both the English and Scottish national teams can be accused of not choosing players due to who they play for although being equally talented or in some cases better. Now this is set in the 80's and that this is still going on today is pretty bad. It most definitely is an issue within sport and really shouldn't be a factor. If intentional, it was done fairly well. The film also delivers a fantastic message to anyone who sees this. It shows that winning isn't the worst important thing and is a great message for those who play or are wanting to get into sport. Eddie was never motivated by winning, just to reach his dream and make people proud of him. And if you try your hardest, regardless of the result you can hold your head up high and the film shows this fantastically. Through the heroes reception he gets to eventual winner Matti Nykanen encouraging him the film shows how you trying your best is really all that matters. I do have some small criticisms of the film but not really anything major. The movie like most sports films is definitely clichéd. It does use a lot of the same plot lines as other sports movies. However in saying this, I don't have a problem with it being clichéd if it is done well which it was done so. Also I really didn't like the father in this film. I find it very hard to believe that a father wouldn't be happy or supportive at all of his son reaching the Olympics. An unbelievable feat and the fact that he doesn't come around until after the events was not believable to me. I also thought the way they had the last event play out took away from the moment. I think that if they had made it a lot smoother with some triumphant music, it would have had a much more powerful effect on the viewer. Instead it took a lot longer and didn't really create as great a moment as it could. A fantastic and funny sports film that is both uplifting and inspiring. Egerton and Jackman are phenomenal in the tale of sports unsung heroes. Definitely worth seeing when it is out in the UK. 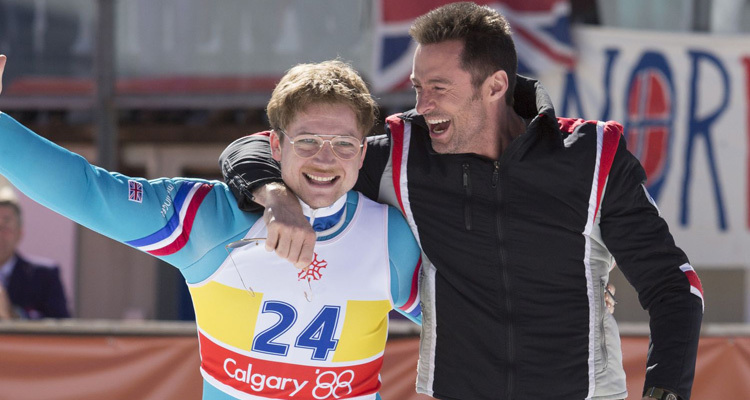 So if you are lucky enough to have seen Eddie The Eagle, what did you think? If you were debating whether or not to see it, I hope this review has convinced you to go see it. Once again thanks for reading, it is much appreciated!